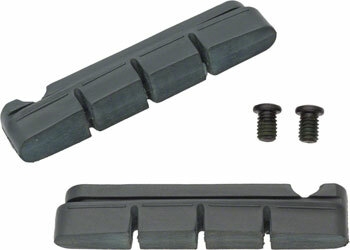 Shimano Cartridge-type road brake pads for carbon rims fit models: Dura-Ace BR-9000, BR-9010, BR-7900, BR-7800, BR7700 Ultegra BR-6800, BR-6700, BR-6600, BR-6500 105 BR-5800, BR-5700, BR-5500 Non-Series BR-R600, BR-R561, BR-R560, BR-CX70. R55C4: High-end race brake pad with excellent wet and dry performance for carbon rims. -1mm reduced shoe thickness for increased rim clearance available. Sold in pairs.